In case you thought that Harbour City couldn’t get any bigger, it now has a new wing, stretching westwards from the cruise terminal; the new space hosts a cluster of new restaurants, which started opening since summer 2017, including the casual eatery Tsukada Nojo. Paper Moon, which hails from Milan but has numerous outlets around the world—including Istanbul and Beirut—was launched in Hong Kong at the end of September. Factor in a bit of legwork if you plan to reach the restaurant from the Star Ferry. Paper Moon is a narrow strip of a restaurant that bends at the back along the side facing the harbour. Dark wood and earth tones set the mood for the dining space, while black-and-white film stills embellish the walls. The banquette seating is prime and spacious, but it is the terrace we are in love with. Wrapping around the restaurant, it has one of the best panoramic views of the harbour in town and is a great spot for firework displays and happy hours with a view of the sunset. Paper Moon is known for its classic Italian favourites, and the restaurant offers a wide range of them; the menu is particularly strong on pizzas and house-made pasta. We began with the restaurant’s deconstructed version of aubergine Parmigiano, a loose stack of aubergine slices roasted with cheese that melts and coats the vegetable. We stuck with the classics when it came to pizzas. The pizza bufala adds buffalo mozzarella to a pizza Margherita base, which is short and crisp on the outside with a good amount of cheese on it. It is, however, was only lukewarm when arrived. Our meal took a better turn with the house-made pasta. 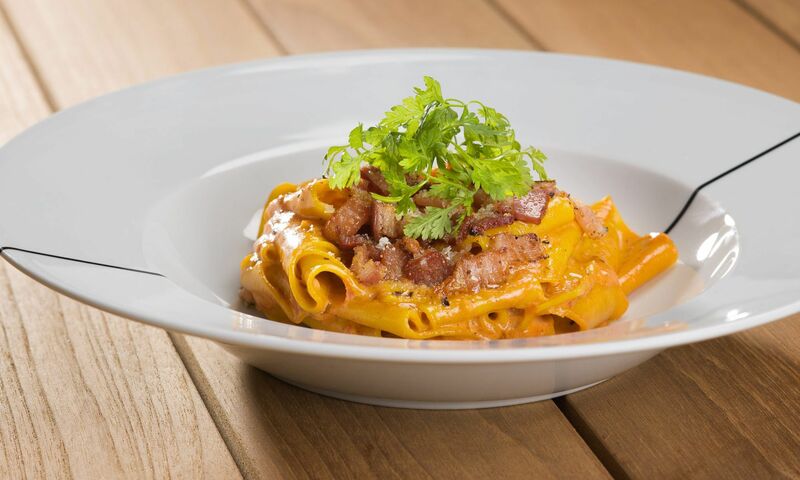 The pappardelle Paper Moon takes wide strips of egg pasta and tosses them in a smoked pancetta sauce, which was on point and well-seasoned. The spaghetti with clams is also a favourite, as the sharpness of garlic oozes out from the white wine sauce while dressing the tender clams and al dente spaghetti strands. The variety of mains is comparatively less of a surprise than the pasta selection at Paper Moon, with classics such as osso buco. The braised veal shank with an aromatic saffron risotto had a creamy, almost custardy texture that had resemblance to a sweet rice pudding. Desserts are often in high demand here. Prepared with light, buttery house-made puff pastry, the strawberry mille-feuille fills lemon-laced pastry cream with chopped strawberries. At the time of order, we were informed that the liquor license was still being processed. The wine list, however, showcases an all-Italian collection with a rich selection of by-the-glass option. The service staff is a young team of attentive servers that require a better understanding of the menu. Paper Moon’s food offerings are reliable and genuinely good value for money, especially enjoyable at a table with a view. It certainly merits future visits, preferably starting with drinks by the sunset and dinner on a clear evening.